Windows 7, Microsoft Corp.’s new operating system due out next week, is giving the company a lot to be happy about. By early reports, it’s fast, easy on the eyes and fixes most of the problems that plagued its predecessor, Vista. But while Microsoft (MSFT) employees are doing the dance of joy, some consumers are confused and scared about the prospect of upgrading their computers to Windows 7. The upgrade from Windows XP to Windows 7 is particularly daunting because it requires first wiping the computer’s hard disk to perform what’s called a “custom” or “clean” install. This clears out the old operating system—as well as all of your programs, files and settings. To save personal files, XP users must back them up first, typically on an external hard disk, then transfer them back. Programs, however, will be lost altogether, so users must re-install these using their original CDs or installation files, and then also re-install all the program updates they’ve accumulated over the years. People upgrading to Windows 7 from Vista may have it easier. In some common cases, they can upgrade to Windows 7 “in place,” which means they can save programs, files and settings right where they were. But since Vista was such a dud, many Windows users still use XP. This week, I tested a program that tries to make the upgrade to Windows 7 just as easy for XP users as it is for some Vista users. I tested Laplink Software Inc.’s PCmover Windows 7 Upgrade Assistant (http://bit.ly/JeafI), a $15 program that saves programs, files and settings on the computer in a place that won’t be affected by the installation of Windows. This eliminates the hassle of using an external hard disk or re-installing programs. The company uses the analogy of a moving van to load up your computer’s information, storing it locally until it can be unloaded again on the same PC with a new operating system. I tested this program using an Acer Aspire One netbook running Windows XP. It took me two hours from start to finish, a three-part process of installing the Upgrade Assistant, installing Windows 7, and then re-installing the PCmover program. I followed instructions and the process of upgrading was really quite easy, showing me the programs and files (photos, videos and documents) I had on my old operating system. Afterward, I did have to dig around on my computer a little bit to make some adjustments, like fixing Apple’s (AAPL) iTunes music program so it opened in Windows 7. And I found it a little annoying that, throughout the process, the Upgrade Assistant tried to get me to buy more software programs, like RegistryBooster and DiskImage, by saying the programs would better prepare my old PC for the switch. Laplink’s $15 PCmover Windows 7 Upgrade Assistant helps smooth the way for some XP users to upgrade to Windows 7. The Upgrade Assistant also works with PCs running Vista. Microsoft offers an in-place upgrade option from Vista to 7, but this mainly works for people transferring from an identical version of Vista to an identical version of 7, like Windows Vista 32-bit Home Premium to Windows 7 32-bit Home Premium. This program won’t magically fix every upgrade issue you face. If you bought your computer many years ago, it may not be able to run Windows 7 at all, because the hardware may be insufficient. Another problem is that most netbooks and some laptops don’t come with built-in disk drives, making it a challenge to install Windows 7, since it comes on a DVD. I had to call around town to find a Radio Shack selling an external DVD disk drive that plugged into my Acer netbook via a USB cord. Some security software programs, like that from McAfee Inc. (MFE) and Symantec Corp.’s (SYMC) Norton Antivirus, may not transfer over to Windows 7, though you should be able to manually install them after the migration. When first installing the Upgrade Assistant, you can choose to do a full migration (files, settings and programs); just move files and settings; move files only; or perform a custom migration. You also can specify which user accounts to include or exclude and you can opt to exclude certain types of files, like temporary files. After the PCmover program assessed the contents of my PC, it explained that it was packing my content into a “moving van”—a file for holding the content—and offered to break the moving van’s content into smaller parts for people who have storage limitations while transferring. It’s a little nerve-wracking to think about transferring your computer’s entire contents over without being able to see where the files are going. At least on an external hard disk, you feel like the files are stored on something tangible and accessible—even if some step in the migration goes terribly wrong and the laptop never starts again, however unlikely. After installing Windows 7 and then re-installing the PCmover program, I was finished. The next time I turned on the PC, a program called StartUp immediately started to run. This appeared to show me a list of programs that automatically ran on my old operating system but which PCmover disabled from running automatically on Windows 7. A quick step allowed programs that I selected to automatically run again. One thing to note as you upgrade from Windows XP is that your PC may not be equipped to deliver the full Windows 7 experience. Windows 7 Upgrade Advisor Beta, Microsoft’s own tool, analyzes what will and won’t work properly when the newest version of Windows installs. The Upgrade Advisor warned me that Windows Aero, the name used for some of the gorgeous visuals in Windows 7, wasn’t capable of working with my netbook’s graphics adapter. Sure enough, Aero’s ability to show tiny, pop-up previews of programs that are running in your taskbar as you hover over them didn’t work. Instead, the names of the files and programs appeared in text-only preview panes. The downloadable version of the Upgrade Assistant is now $15 for one license to use on one PC—a special pre-release price before Windows 7 is available Oct. 22. After that, the downloadable version will cost $20 from Laplink.com for one license to use on one PC. If you would rather not download this program, it also will be available for purchase in retail stores by the end of October. Of course, you also will have to buy a copy of Windows 7; the version most consumers will want is called Home Premium and it costs $120 as an upgrade. 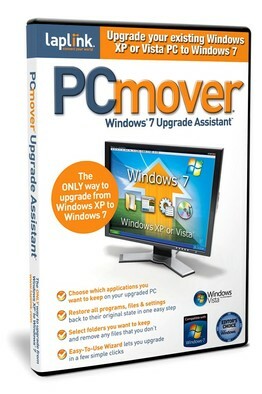 If you are considering Windows 7 and you are currently using Windows XP on a relatively new PC, a simpler and better-organized migration process is worth the nominal price of Laplink’s PCmover Windows 7 Upgrade Assistant.